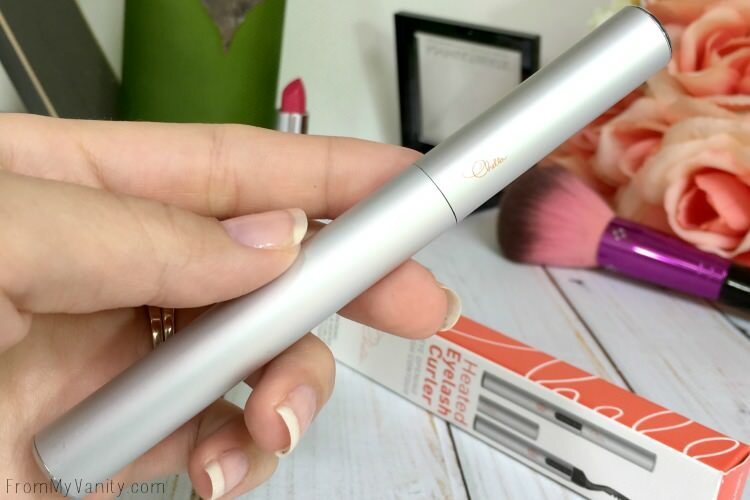 I honestly wasn’t sure what to expect when I tried this heated eyelash curler from Chella for the first time. It seemed like a gimmicky product, since it doesn’t have a way to really grab onto the eyelashes and force them upward. But, as the title suggests…I was pleasantly surprised by this device! 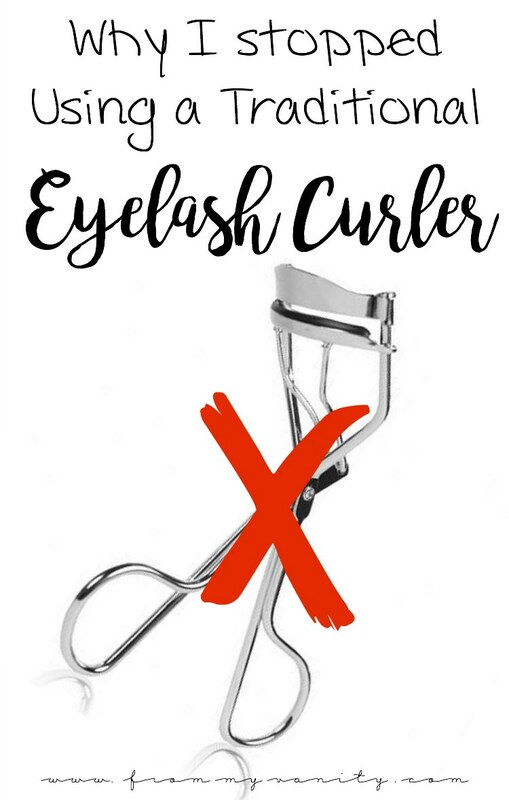 A little bit of a backstory: I have never liked the traditional eyelash curler — especially the sharp, unnaturally ‘bend’ it would give my lashes. And then there was that time it accidentally cut a few of my lashes in half! 😮 Because of this…more often than not I would opt out of using an eyelash curler. 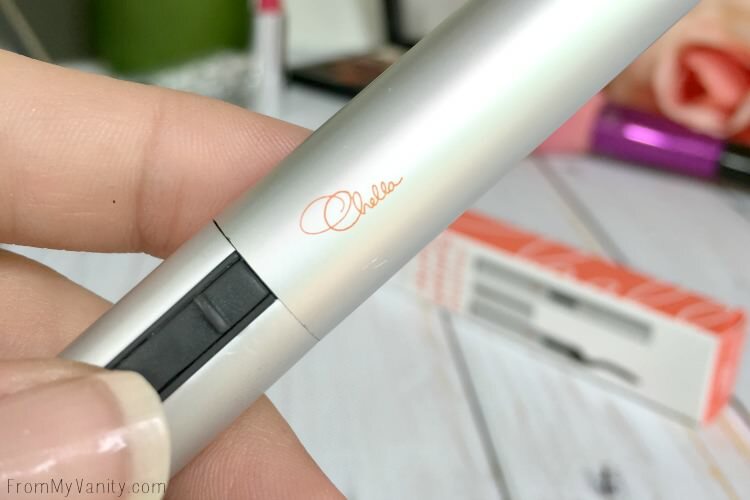 So when Chella approached me about trying out some of their products, the heated eyelash curler really intrigued me. I’d seen products like this before, but never tried them. I loved the idea of not crimping and bending my lashes (that’s good on your lashes over time, right?). I liked the way they designed the packaging. It’s made from metal and is slender, like a mascara tube. The cap slides right off, there is no magnetic or slip to really lock it on, so there are times when I pull it out of the drawer that I find the cap slipped off. There is one coil that is bent in half inside the ‘comb’ of the mascara head that heats up when you push the power switch on. Which, by the way, has a safety off — when you put the cap on it automatically pushes the power button down, thus turning it off. That was a big question I had! I’m pretty clumsy, and the thought of a burn on your eyelid sounded…terrible, really. I purposely tried to use this device in a way that I might burn myself (the things I do to test products out…), and I never could. I could feel that there was heat coming from the comb — very slightly — but nothing worth noting, really. 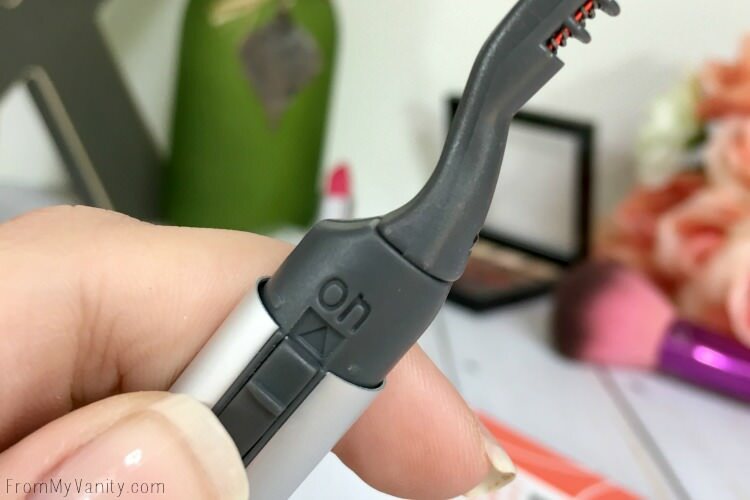 How Does It Work Compared to a Traditional Eyelash Curler? Unlike a typical one, this heated eyelash curler just combs through your lashes, exactly like a mascara wand would. 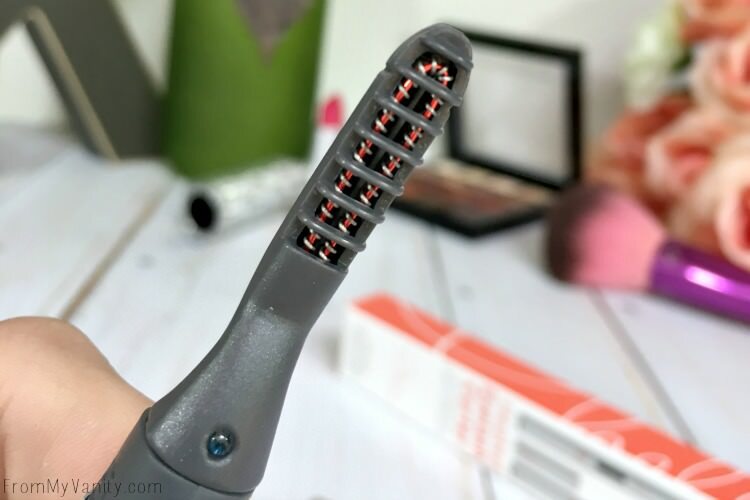 I honestly didn’t have high hopes for this replacing the sharp curl that my clamping eyelash curler would, since there was no pressing upwards involved with this device. But, as you already know, I was wrong! These pictures were taken before I applied any makeup, as I wanted you to really be able to see my lashes (what there are of them, at least!) And I think the picture says it all! I mean, come on, there is SUCH a noticeable difference! I hadn’t applied mascara, remember, so you can tell that the heated eyelash curler helped lift my lashes — especially on the outer corner. 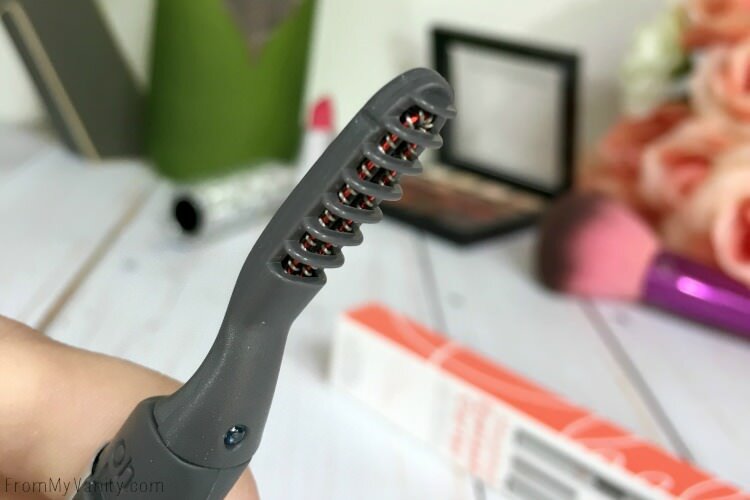 Those lashes like to point down but with this device they curled upward beautifully! 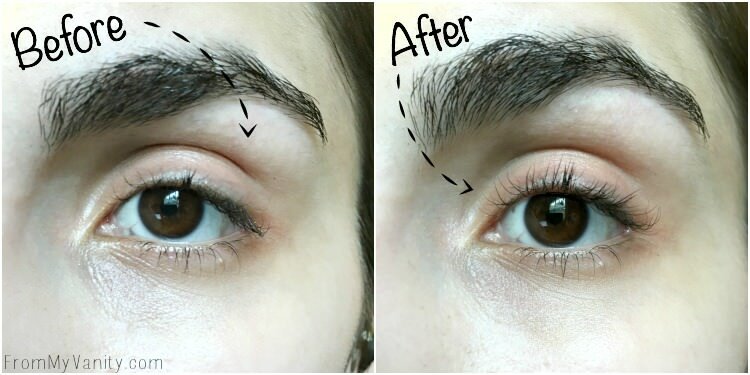 It takes longer than if you used a traditional eyelash curler. I like to wait at least 10-15 seconds after I switch it on for it to heat up. And then I spend a good time curling through and really pressing my lashes upward against that heated coil. I would say I spend 20-30 seconds on each lash. But that honestly doesn’t bother me — I don’t mind spending extra time on my lashes if the results are amazing and gives me peace of mind that my lashes won’t break off. This also has a battery, so you will have to replace that over time. Or if you’re like me, you’ll have to replace it on the fourth usage because you forgot to turn it off the last time you used it. *blush* Yeah, so, that can be a con if you are forgetful. But it only takes one AAA battery, so it’s not that expensive. And I learned my lesson that first time and haven’t forgotten since! I know I’ve been gushing about this Chella Heated Eyelash Curler a bit too much…but I am honestly so excited about this find! 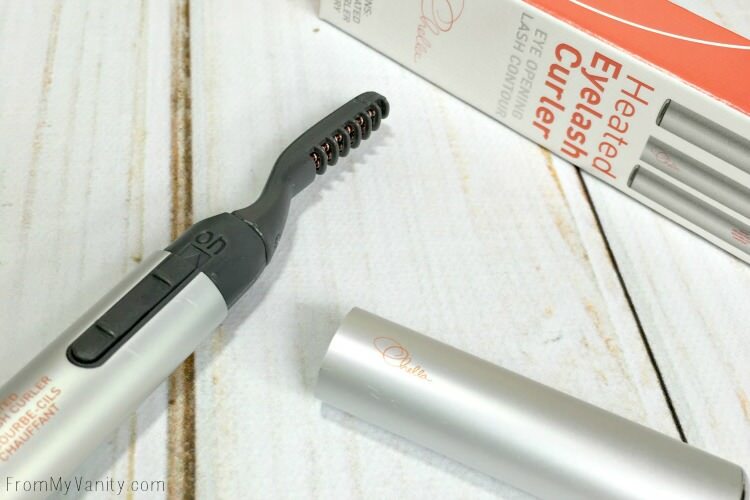 It has totally changed my eyelash game and I LOVE the curl I get. I never notice them drooping by the end of the day, though I have never tested them without applying mascara on top, so…keep that in mind. But, to be completely real and honest with you all — is this the best heated eyelash curler out there…I don’t know. This is just my first heated eyelash curler that has opened my eyes to the world of curling your lashes without crimping them. And I am excited to continue to use this little device! Have you ever used a heated eyelash curler? Am I alone in my fear of the the traditional device? 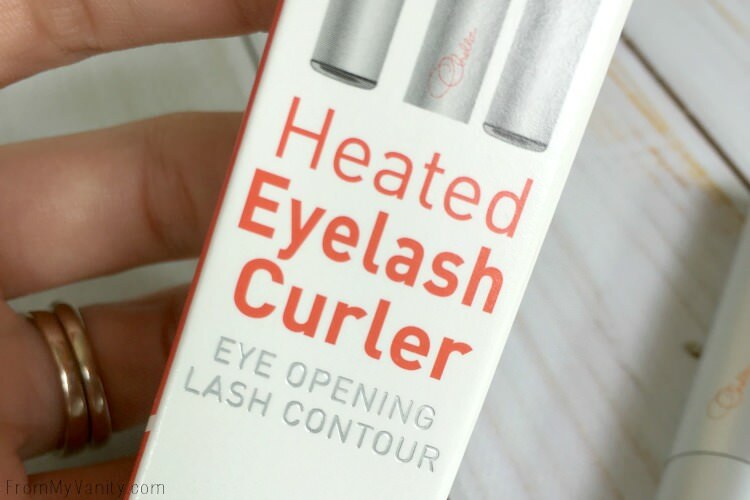 Let me know if you’ve used this heated eyelash curler before, or if you would sometime in the future! Share This Pin if You Found it Helpful! 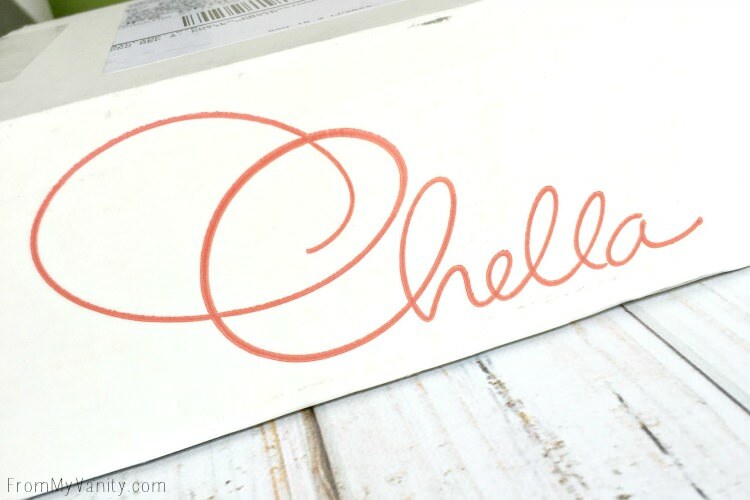 I’ve heard about this product but hadn’t seen it or a review of it yet! This is really intriguing. I am always paranoid that i will rip my eyelashes off with a regular curler. I bought this a while ago and totally need to find it so I can start using it. Such a great difference for sure!!! Great post! I was skeptical, but it really does work! That device looks kinda scary but the results are amazing! I know, it can be intimidating, but it doesn’t take long to get the hang of it! As someone who hates eyelash curlers, I’m intrigued by this. I never curl my lashes because I saw my friend accidentally cut hers off with a traditional eyelash curler. I don’t know what exactly happened but she pulled the lash curler away after curling and all of her lashes were still on it. So scary! I kind of want to try this, though. It sounds much friendlier. Yes, I know! I hear people talk about using the eyelash curler and one day it just snapping them off!! :-O And since I am someone who does not wear false lashes….that would be HORRIBLE! This device has been such a game-changer for me! I am terrified of eyelash curlers – I can’t will myself to use them! I’ll have to look into a product like this!! I am a huge fan of Chela. 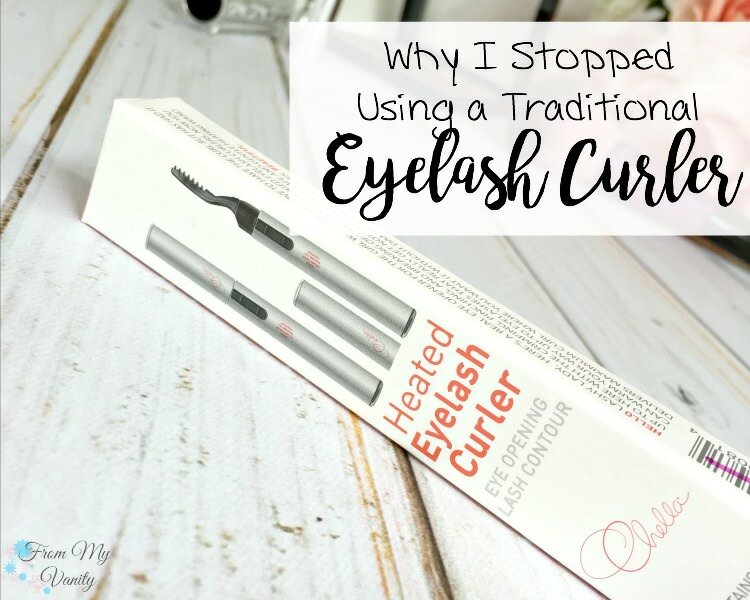 I have a heated eye lash curler I enjoy, but I do like the traditional curlers… when I’m not poking my eye… hehe! Haha, yes, I would often pinch myself — ouch! I’m intrigued. I’d love to try this. Wow! This sounds interesting! I feel like I would screw up some how though, I’m pretty accident prone! I often have VERY shaky hands — to the point where it can be hard to do my winged liner some days. I feel you, girl! I think I need this if I ever give up lash extensions! After yanking out a bunch of lashes just recently this is on my must buy list. Thanks! I tried one of these a few years ago and it was a hunk of junk. I’ll look for Chella.